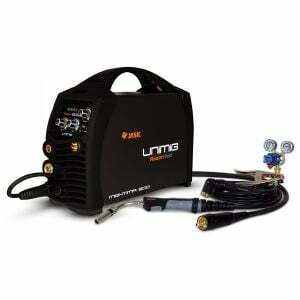 The RAZOR 250 is a new inverter-based portable MIG welding machine with added MMA and TIG function. The MIG function allows you to weld with both Gas Shielded and Gasless wire applications. Easy stepless adjustment of voltage and wire feed make for easy setting of welding parameters giving excellent, professional welding results. Wire inch gives easy feeding of the wire during set up without gas wastage and the Burn Back adjustment leaves the wire out ready for the next weld. MMA welding capability delivers easy electrode welding with high quality results, including cast Iron, stainless and low hydrogen. 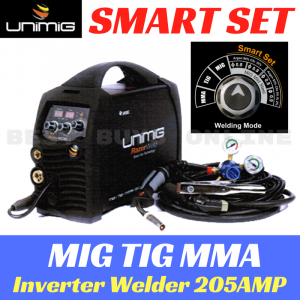 Connection of the 26V TIG torch provides quality DC TIG with Lift Arc start for welding of steel, stainless steel and copper. An additional feature is the Spoolgun ready function that allows the simple connection of the SPG200II Spoolgun for the use of thin or softer wires that don’t have the column strength to feed through standard MIG torches, such as aluminium wire. This an industrial machine that is lightweight and portable, an optional trolley with tool drawer and cylinder rack provides off the floor operation and better manoeuvrability around the workshop. Being 240v single phase gives great portability. Ideal for general engineers, maintenance workshop and rural workshop. Designed and built to our specification. Certified to - AS/NZ60974-1.